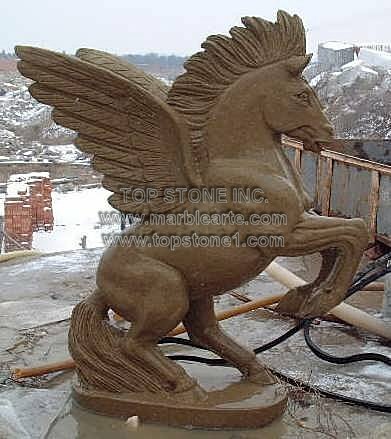 Description: TSAL070 - As far as statues have grown up, Pegasus stills remains to be the children’s favorite. Straight out of a fairytale, this magnificent piece of marble art is a force among animal statues. As much as they can be set up as large garden sculptures and as lawn statuary, the power behind Pegasus can and will be found only as a sculpture with a preeminent place of honor. They do not hold the title of being one of the famous marble statues for nothing. Hence give it its due and set up these as a sheltering winged sculpture for home rather than among your vegetables and critters. You can buy this at a marble statue for sale or you can even buy marble statues online, if you were wondering where to buy garden statues. So there it is, now go get one.